Synthetic peptide conjugated to KLH derived from within residues 1 - 100 of Mouse SYT2. 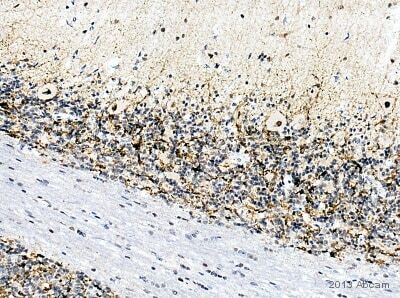 This antibody gave a positive signal in the following Mouse tissue lysates: Brain; Spinal Cord; Cortex; Hippocampus; Cerebellum; Forebrain; Substantia Nigra. 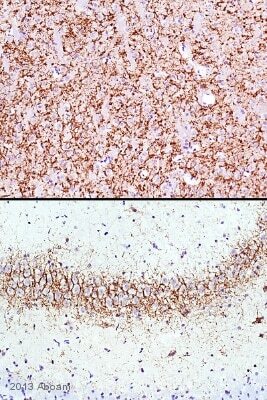 This antibody gave a positive result in IHC in the following FFPE tissue: Mouse normal brain. Our Abpromise guarantee covers the use of ab113545 in the following tested applications. IHC-P Use a concentration of 0.5 µg/ml. WB Use a concentration of 1 µg/ml. Detects a band of approximately 70 kDa (predicted molecular weight: 47 kDa). May have a regulatory role in the membrane interactions during trafficking of synaptic vesicles at the active zone of the synapse. It binds acidic phospholipids with a specificity that requires the presence of both an acidic head group and a diacyl backbone. Belongs to the synaptotagmin family. The first C2 domain mediates Ca(2+)-dependent phospholipid binding. The second C2 domain mediates interaction with Stonin 2. Cytoplasmic vesicle > secretory vesicle > synaptic vesicle membrane. Cytoplasmic vesicle > secretory vesicle > chromaffin granule membrane. Synaptic vesicles and chromaffin granules. 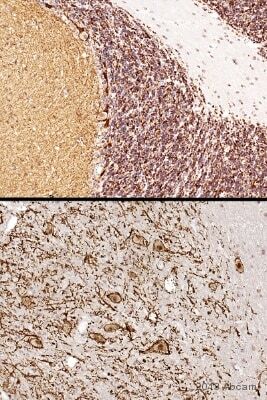 IHC-P image of SYT2 staining on sections from rat thalamic nucleus (upper image) and the CA3 region of the rat hippocampus (lower image) using ab113545 (1:5000). The sections were deparaffinized and subjected to heat mediated antigen retrieval using citric acid. The sections were blocked using 1% BSA for 10 mins at 21°C. ab113545 was diluted 1:5000 in TBS buffer (containing BSA and Azide) and sections were then incubated with ab113545 for 2 hours 10 minutes at 21°C. The secondary antibody used was Biotin conjugated Goat polyclonal to Rabbit IgG (1:250). 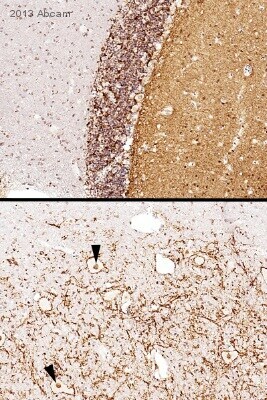 IHC-P image of SYT2 staining on sections from mouse sagittal hippocampus (upper image) and dentate nucleus of the mouse cerebellum (lower image) using ab113545 (1:5000). The sections were deparaffinized and subjected to heat mediated antigen retrieval using citric acid. The sections were blocked using 1% BSA for 10 mins at 21°C. ab113545 was diluted 1:5000 in TBS buffer (containing BSA and Azide) and sections were then incubated with ab113545 for 2 hours at 21°C. The secondary antibody used was Biotin conjugated Goat polyclonal to Rabbit IgG (1:250). 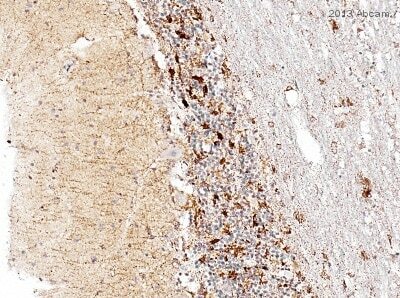 IHC-P image of SYT2 staining on Marmoset cerebellum sections using ab113545(1:7000). The sections were deparaffinized and subjected to heat mediated antigen retrieval using citric acid. The sections were blocked using 1% BSA for 10 mins at 21°C. ab113545 was diluted 1:7000 in TBS buffer (containing BSA and Azide) and sections were then incubated with ab113545 for 2 hours at 21°C. The secondary antibody used was Biotin conjugated Goat polyclonal to Rabbit IgG (1:250). The predicted molecular weight of SYT2 is 47 kDa (SwissProt), however we expect to observe a banding pattern around 70 kDa. Abcam welcomes customer feedback and would appreciate any comments regarding this product and the data presented above. 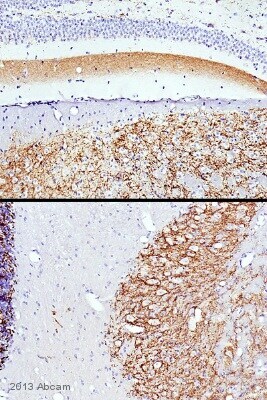 IHC image of SYT2 staining in Mouse normal brain formalin fixed paraffin embedded tissue section, performed on a Leica BondTM system using the standard protocol F. The section was pre-treated using heat mediated antigen retrieval with sodium citrate buffer (pH6, epitope retrieval solution 1) for 20 mins. The section was then incubated with ab113545, 0.5µg/ml, for 15 mins at room temperature and detected using an HRP conjugated compact polymer system. DAB was used as the chromogen. The section was then counterstained with haematoxylin and mounted with DPX. ab113545 has not yet been referenced specifically in any publications. Publishing research using ab113545? Please let us know so that we can cite the reference in this datasheet.